Saturday night’s NASCAR Dodge Weekly Racing Series Havoline Western Late Model 50 lap feature at Stockton’s 99 Speedway was essentially over when the green flag waved to start the race. Pole sitter Eric Humphries,#32, of Chowchilla grabbed the lead on the 12-car field coming out of turn two. After that the only thing the other contenders saw of Humphries was his bumper as he went wire-to-wire in a caution free race for his first win of the season. The win was especially sweet for Humphries after he was spun out while leading in last Saturday’s HOTWOOD 1000 race by Stockton’s Ron Strmiska Jr., (right), That incident overflowed into some after race bumping on the cool down lap for which each of them was given a ten-point penalty by track officials. Following Humphries to the checkered flag to complete the top five were #20, Pete Hernandez, (right), of Sacramento for second, Strmiska, Pacific Grove’s Dave Byrd and Manteca’s Guy Guibor. “I can’t complain. I will take second. It helps us in the points and we came away with a clean car,” said Hernandez, a NASCAR diversity driver for Bill McAnally Racing. After taking the fast time in qualifying and winning the trophy dash #10, Jay Linstroth of Citrus Heights was poised to earn his second straight clean sweep in the Grand American Modified (GAM) division until he got tangled up Tony Noceti, #6, of French Camp on lap 18. As a result of the incident both ended up at the back of the pack, Linstroth due to the spin and Noceti for causing it, and neither driver was happy about it. When the green flag came out Linstroth quickly charged back, gobbling up the rest of the field like a turkey on steroids, but he was only able to make it back to second as Jason Kerby, #2, of Galt held him off to pick up his first win of the season. Hometown driver #75, Chad Holman earned his second straight victory in the C.L. Bryant sponsored American Limited Stock Car 30-lap main by just nipping Jeff Ahl, #31, of Lodi at the line. The crowd was on its feet as the two went door-to-door for the final two laps following a restart due to a late race caution. “I thought it was my race tonight and then I saw that yellow come out. What a heartbreaking loss,” said a dejected Ahl. Mark Henslee, #6, of Lathrop picked up his second Pro 4 Truck win of the year against an 11-truck field, the largest of the season. Jacob Gomes of Manteca drove to victory in the 20-lap Mini Cup Young Guns feature. The 13-year-old looks to be a star of the future having notched an amazing 19 wins in 20 races dating back through last season. Gomes lists his dad, Dale Earnhardt Jr. and Dave Byrd as his racing heroes. A fast track produced three new qualifying records on Saturday, Pro 4 Trucks - Ron Robeck of Milpitas (15.201 seconds), Mini Cup Young Guns - Jacob Gomes of Manteca (16.833 seconds) and the American Limited Stocks - Donny Darter of Stockton (15.517 seconds). 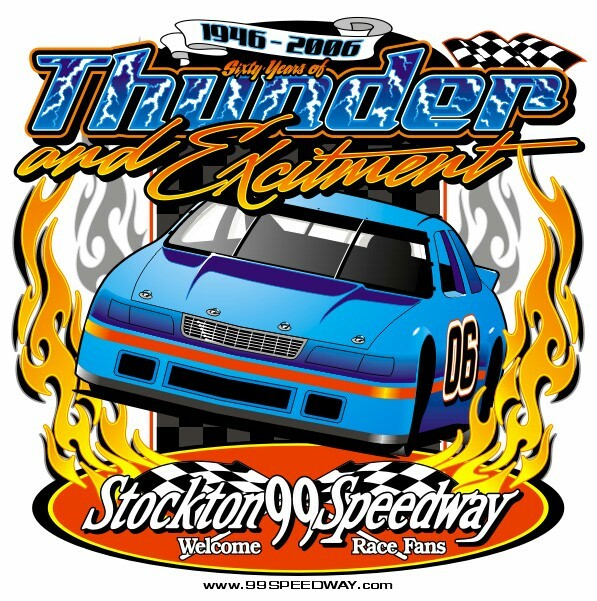 The Tri-Holiday Twin 100’s, featuring round #4 of the HOTWOOD 1000 Series by JM Environmental for the Havoline Western Late Models and the West Car Series, will highlight next Saturday night’s big Memorial weekend program at the Stockton 99 Speedway. Also on the card will be the American Limited Stocks and Pro 4 Trucks presented by C.L. Bryant.